For more information about the DeTour Reef Light Preservation Society, the lighthouse, to tour the lighthouse, or how to sign up for an outstanding offshore lighthouse experience as an overnight keeper, please visit www.DRLPS.com or call 906-493-6609. A lighthouse has been located at DeTour Passage in northern Lake Huron at the far eastern end of Michigan’s Upper Peninsula since 1847. Originally placed onshore at DeTour Point, the Light was built a mile offshore at DeTour Reef in 1931. The historic DeTour Reef Light marks the mouth of the strategic St. Mary’s River which connects Lake Huron to Lake Superior. 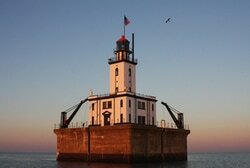 It is well known to ship captains and pleasure boaters who sail the upper Great Lakes. Sitting on a unique crib base and rising 83' above water with its 63' tall Classic-Revival-style architecture, DeTour Reef Light stands as a testament to the importance of shipping in the region's political, economic and social history. In 1974 the Light was automated and by 1997 the lighthouse had been declared excess property by the U.S. Coast Guard. 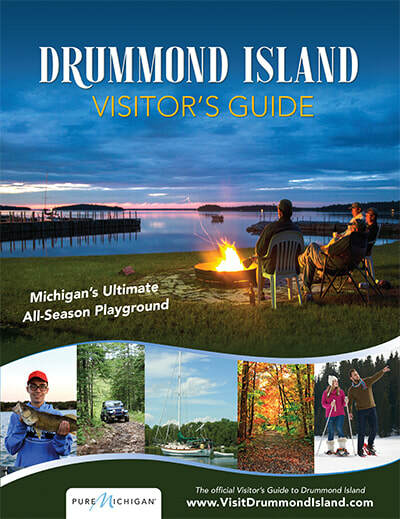 In January 1998 the DeTour Reef Light Preservation Society (DRLPS) was formed by civic leaders from the local communities of DeTour Village and Drummond Island, Michigan. The DRLPS is a nonprofit volunteer (501C3) organization dedicated to preserving and restoring the lighthouse for all to enjoy. Determined DRLPS volunteers, along with government and private funding, restored the lighthouse to its 1931 appearance. The organization has offered popular guided tours and overnight keeper programs since 2005. In 2006, the DRLPS received the Historical Society of Michigan’s Superior Award in recognition of its achievements in preserving and advancing Michigan’s Upper Peninsula history. In 2008, the DRLPS celebrated 10 years of "Keeping the Light On" and will continue to preserve the lighthouse for generations to come.